My gluten-free husband loves his granola. We’ve tried nearly every brand of gluten-free granola and found several we liked, but we’ve never liked the price tag. Below is a recipe everyone is sure to enjoy and is full of high-quality ingredients not prevalent in most store bought Gluten-free granola. Because we enjoy it and don’t want to make it more than once a week, below is a double recipe. You won’t be sorry you make this recipe even if only a few indulge. We like to share ours with neighbors, eat it with peanut butter or yogurt or my favorite…as a standalone snack. Prepare two half sheet baking pans with cooking spray or parchment paper. In large microwavable mixing bowl, combine maple syrup, brown sugar, coconut oil, butter and salt. Microwave for approximately 30 seconds or until butter and coconut oil are melted. Add vanilla and mix thoroughly. In another mixing bowl add oats, coconut, almonds, pecans, and raisins. Mix thoroughly. Combine all ingredients together thoroughly. Divide mixture between the two baking pans and press firmly until evenly spread across pans. Bake for 30 minutes. Rotate pans and switch racks after 15 minutes and return to oven for final 15 minutes. After removing from oven, sprinkle dried fruit over hot granola. 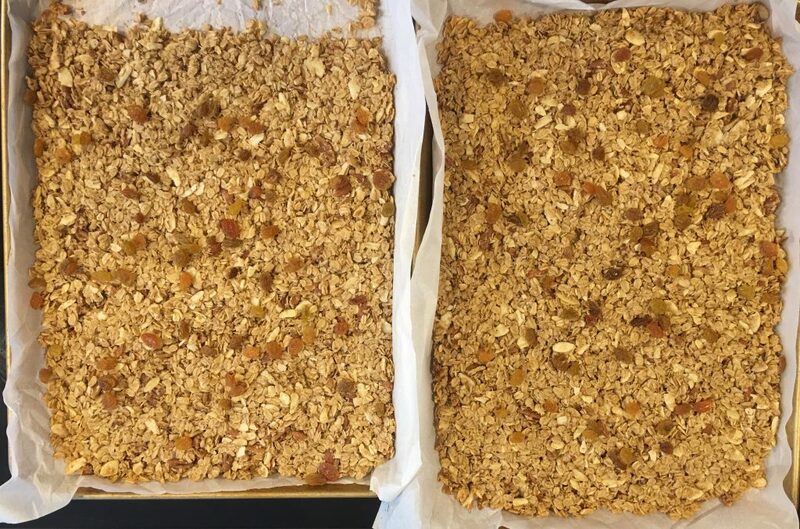 Let granola thoroughly cool and cut into bars or break into pieces. Store in resealable bags or containers. **We buy Bob’s Red Mill Gluten-free Old Fashioned Rolled Oats and Costco’s coconut oil, nuts, vanilla, Maple syrup, Kerry Gold Butter. My love for squash casserole goes back to my childhood days when my grandmother made southern style casserole topped with breadcrumbs or Ritz crackers. Celiac disease and gluten free living for several years sent us to squash roasted in the oven or cooked lightly on the stove. And we eat a lot of squash! 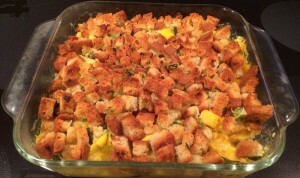 Because we were a bit tired of “plain” squash, this recipe for gluten free squash casserole saved the day! Place chopped squash and onion in pot. Add bread cubes to saucepan and cook until toasted. ** We avoid bread and often top this casserole with only cheese. * We haven’t tried it yet but think chopped water chestnuts would be a nice addition to this recipe. What do you think? 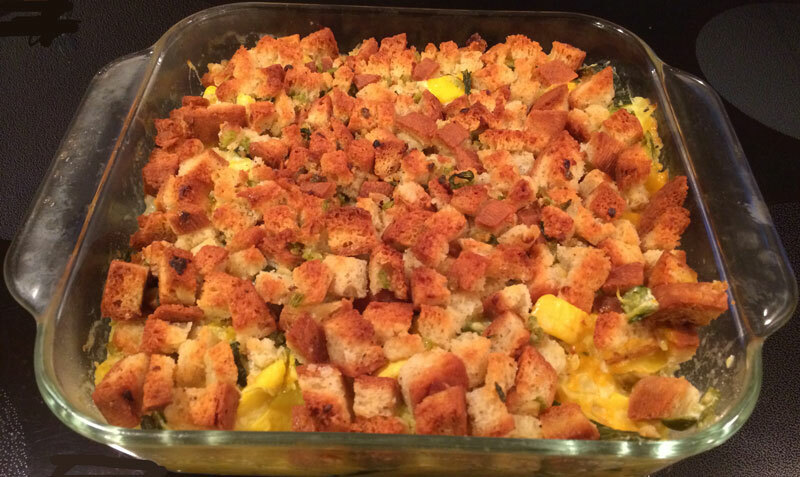 If you are looking for variety for your squash or just want a squash casserole – this might be the recipe for you. Recently we purchased several gluten free mixes online from Williams-Sonoma. We don’t eat a lot of cupcakes around here, so it is a treat when we have fresh GF baked goods! Let me start by saying that these mixes are pricey – $12 for a mix that makes 12 cupcakes. 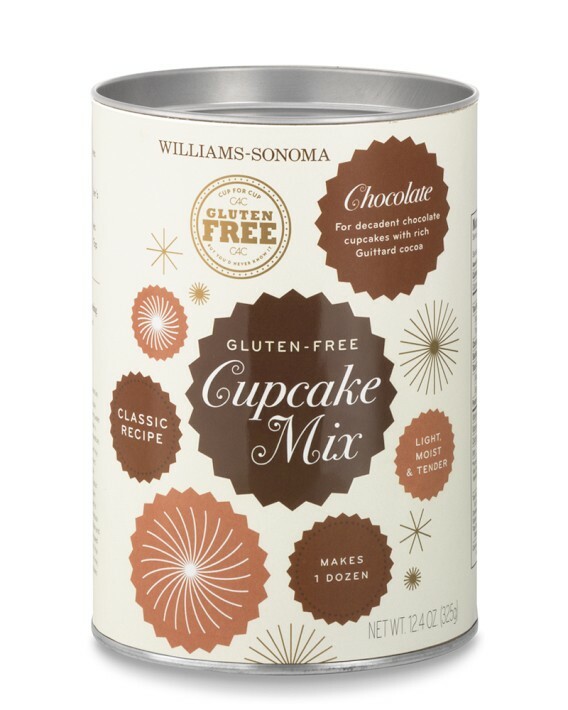 Even the mixes that are not gluten-free at Williams-Sonoma are pricey – but they are still more reasonable than buying them from the bakery! I was expecting a very chocolatey cupcake! The flavor reminded me of a red velvet cake with a hint of chocolate and in my opinion, did not have a deep chocolate punch. Wow! The texture was absolutely perfect! You would not be able to distinguish it from its ‘non’ gluten-free counterpart if you didn’t know any better. Texture is where the mix shined! Texture is so important in a cake. If it’s too heavy or mealy or dense it just is not worth eating. The cupcake held together nicely and was not too crumbly or tough. 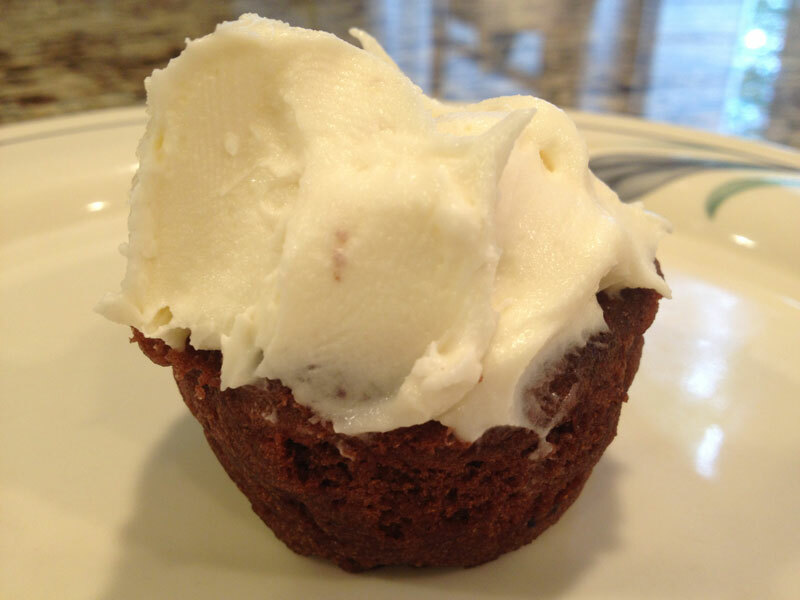 We already had some cream cheese frosting in the refrigerator, so we paired the cupcake with it. Maybe that’s what contributed to it tasting like a red velvet cake. I suspect that the butter-cream frosting suggested on the package would be a better choice to pair with this chocolate cupcake. Note – we did not frost the cupcakes until we were ready to eat them. Also, we only made half of the mix by splitting the ingredients. I often split a mix to accommodate our small family with a fresh treat so not to be tempted to eat four cupcakes in a day or two. We could freeze them, but I prefer freshly baked. Wrap up – if we make the cupcakes with Cup4Cup flour from scratch, the process would be only slightly more difficult and would likely yield a similar, and potentially more flavorful cupcake. 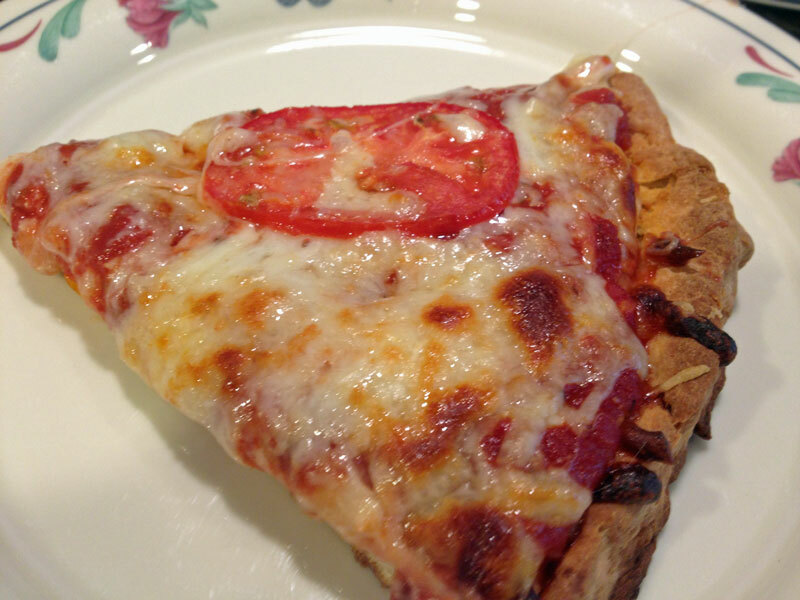 Are you looking for scrumptious gluten free pizza crust? Yes, we know. It is nearly impossible to find. Occasionally we venture to local pizzerias for a GF pizza, but most GF crusts are nothing more than cracker-like ‘topping transporters’. When desperate, a ‘topping transporter’ can do the trick to satisfy one’s taste for a pizza pie…but don’t you want more? The mix makes two 12 in crusts and contains dry ingredients with a yeast packet. We only wanted to use half the mix since we don’t eat pizza often. What would we do with a single mix? 3 – Bake both crusts and freeze one. We didn’t want to eat pizza again within 3-4 days and freezing seemed risky. It was easy to measure the dry ingredients and a bit tricky halving the yeast…but definitely do–able. We used half the warm water then mixed up one egg. I confess, we didn’t use half an egg! If you have more than two people this halving ritual shouldn’t be an issue. You will need two pizzas! The dough was simple. Just add warm water and egg to the dry ingredients and knead. The instructions specifically say not to add additional flour when forming the crust. When our dough got sticky, a tiny bit of olive oil on the fingers did the trick. Once the dough is together, simply pat it into a 12 inch round and put it on an olive oiled pan. Add olive on top of the crust and par-bake it in a 500 degree oven for 8-10 minutes. Once your crust is par-baked, add your favorite toppings. We used Muir Glen organic pizza sauce, mozarella and parmesan cheese, roma tomatoes and crumbled Aidell’s GF organic meatballs. For visual instructions and videos see Williams Sonoma’s website. – Great texture as a thin crust. Nice and crunchy, stays together well. – Makes better leftovers than any gluten filled crust I ever had. – Let the egg come to room temperature before adding to mix if possible. – Rub a little oil on your fingers if the dough gets too sticky to handle. – Make the crust thin. Don’t try to make a thick crust – you’ll notice the lack of gluten’s chewiness more as the crust gets thicker. – Use toppings at room temperature or warm them before you top the pizza. This will make the pizza cook more quickly and keep the crust from over baking or burning. 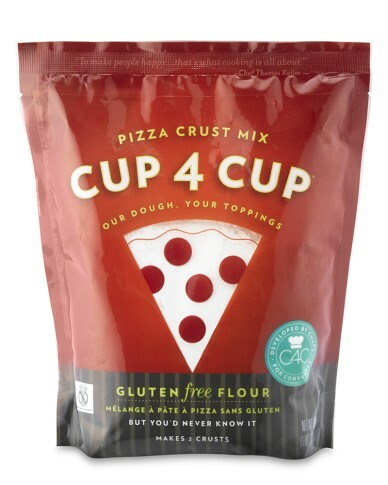 Be prepared for your next pizza craving and keep Cup4cup GF Pizza Crust mix on hand!